ZTE Corporation and China Unicom have announced the commercialization of ZTE Magic Pole solution in the city of Xi’an, located in the Shaanxi province of China. The Magic Pole is an innovative solution that integrates a microwave backhaul solution with an antenna on a street pole. This wireless link can be used to improve network quality across the city. So now regular street lighting can be used to improve network coverage. 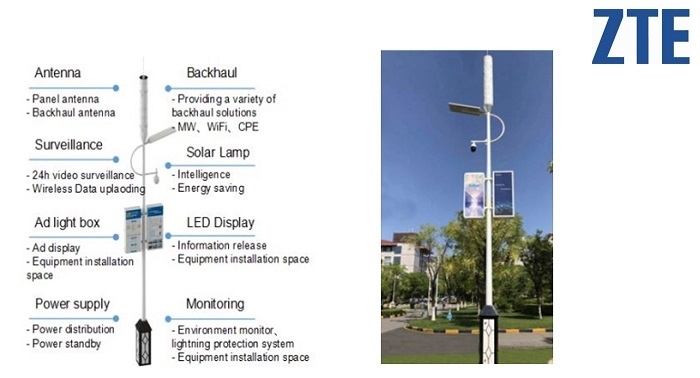 In addition to improving network coverage and providing street lighting, the Magic Pole has a small-pitch full-color LED display screen, that can run commercial and public service advertisements, helping Shaanxi Unicom (Shaanxi arm of China Unicom) generate advertisement revenue, and thereby fulfilling social responsibilities as well. The Magic Pole Solution is powered by solar energy which makes it even more cost effective and environmentally friendly. The commercialization is expected to greatly improve poor network quality during rush hour in Chang'an Communication Industrial Park in High-tech Development Zone of the metropolis in China. As wireless data usage has skyrocketed in recent years, all major operators are confronted with a new challenge of increasing the density of their network coverage to meet the continually growing demand and improve user experiences. Considering environmental protection, high entry fees, difficulties in site selection and acquisition, there are many restrictions in deployment, operation and maintenance of macro base stations as well as distributed base stations. The Magic Pole solution helps provide an innovative solution to this problem.